Originally, our Stanfield Pet Heating Pads were designed as “pig blankets” in agricultural spaces. Today, they are used in zoos, kennels, animal hospitals, sanctuaries, and even in your own home. They work well on any floor surface as long as the temperature of the pad matches the floor type. 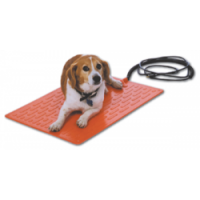 Stanfield Pet Heating Pads work ideally in a home environment that is maintained between 60 to 70°F. In that environment, the surface of the heat pad will average 90 to 100°F without any temperature control. However, it is recommended to always use a temperature control to set the pad at the ideal temperature for your type of flooring and your pet. Allow about one hour after power is applied to measure the surface temperatures accurately. Many tortoises do not hibernate and require a steady, comfortable environment all year long. A tortoise sitting on a floor in an insulated room can still become chilled, which may lead to respiratory, digestive or other problems. By using our electric heating pad, you can keep your tortoise happy and healthy in heat-regulated living quarters. Besides keeping your dog or cat warm and safe during the harsh winter months, another benefit of pet heating pads is that they can be used to comfort pets with arthritis, hip dysplasia, or other joint or muscle aches. For all reptiles and amphibians, providing appropriate temperature is extremely important. Being cold-blooded, they rely on external warm temperatures to regulate their own body temperature. By using this specially constructed pet heating pad, you can provide a safe, warm resting spot throughout the day and night. Osborne Pet Supply offers the best, zoo-trusted heating pads for keeping animals warm, comfortable and healthy. No matter what animal you own, rest assured Osborne offers you the best. To learn more about the expert-approved products at Osborne Pet Supply or more specifics on Stanfield Pet Heating Pads, call 1-800-255-0316 or visit our contact us page.